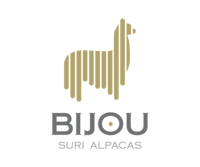 Discover Your Exquisite Suri Jewel! Rufino & Batiste Color Genetics! Wow! Sire Wyldfyre in full fleece! Bred to KOBE - Macgyver Granddaughter! 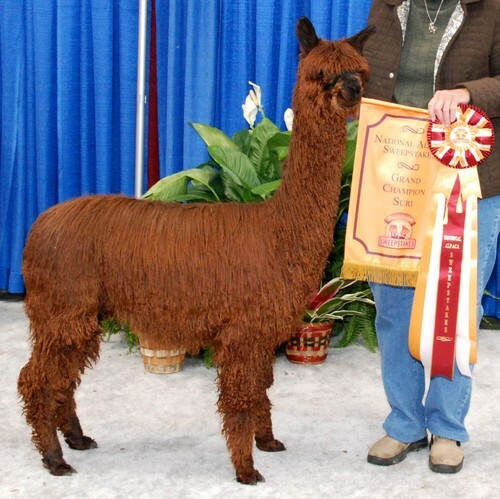 Peruvian Wyldfyre is fast on his way to becoming one of the country's outstanding dark colored Suri herdsires! Wyldfyre was the 2009 AOBA Nationals Res. Champion, with some 800 Suris. 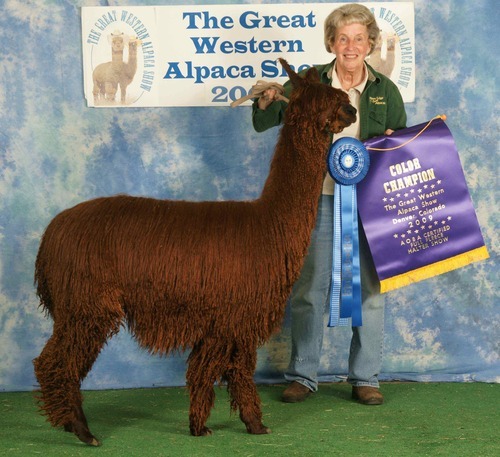 He was the GWAS Champion and placed 1st at the 2009 Futurity. 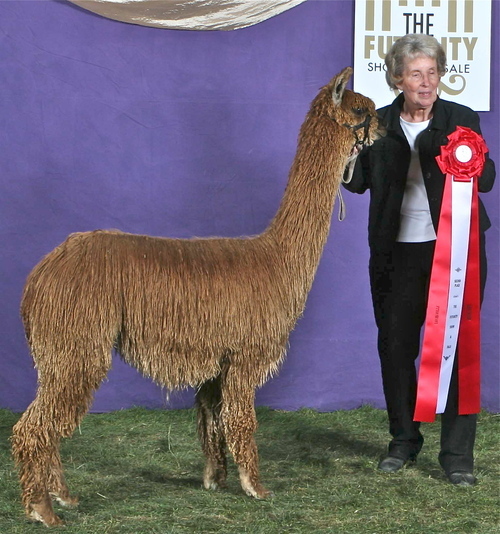 As a juvenile, Wyldfyre was the brown male National Alpaca Sweepstakes Champion under the 3 judge system, 2nd in a class of 11 at the level 5 GWAS 2008 show, and 2nd at AOBA Nationals in 2008. 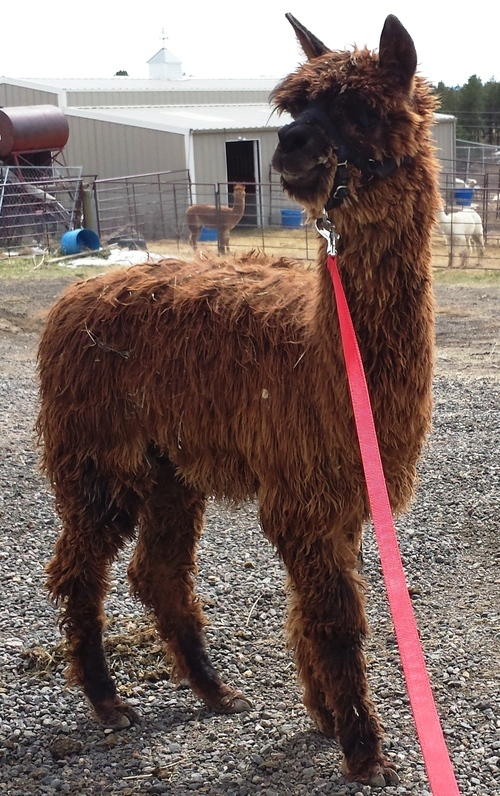 Sierra Gold is the first daughter of Snowmass Nina. Sierra has a fleece with great density and luster and exact conformation with strong bone. She has proven her quality in the show ring at the largest shows in the country, earning 1st place at just 6 months of age and she later placed 2nd at the very competitive Futurity. Sierra has shown that she has inherited her mother's high milk production and ability to deliver strong healthy crias. We are expecting great things from this cute little Wyldfyre daughter and Macgyver granddaughter! 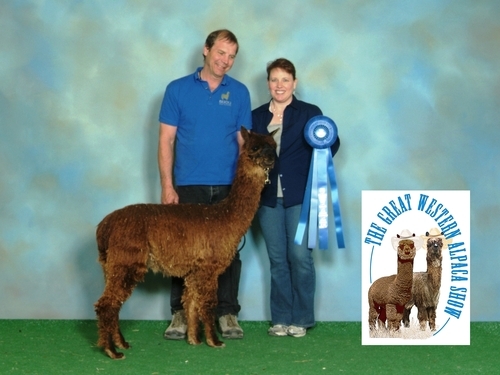 Topaz Fyre just took her first Blue Ribbon at 2014 GWAS! Amanda VandenBosch commented especially on Topaz's fineness of fleece. Because we have Topaz's dam, Sierra Gold as one of our foundation females, Topaz Fyre is offered for sale. Also check out all the amazing awards that her sire, dam, and siblings have earned! Topaz just took another BLUE ribbon at Fall Fest 2015! We offer flexible financing to meet your needs with no interest for a year.